You can tune in and watch Equestrian action on the BBC. Our cameras will bring you live action from the top events throughout the year. 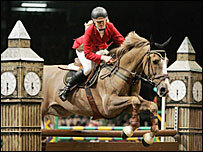 We will be following all the British competitors, including Zara Phillips, as they warm up for the 2008 Olympics. Highlights of certain events will be available on this website and live action from Olympia will be on BBC Interactive. If you have any questions about the BBC's Equestrian coverage please email us using the form below.